For many years, Restaurant El Centro has been a place of pilgrimage to many curious people, lovers of a unique landscape, of the abrupt land, and its singular flora and fauna that surround it. A series of singularities that make the restaurant a unique space, valued by many lovers of the nature, that day after day take a walk in the Guayadeque ravine and then take a break to regain strength and continue their route; or simply those who know that a meeting in the cosy caves with their loved-ones, those who they, too, enjoyed back in the day of our Restaurant’s Canarian gastronomy, will be backed up with the kindness and closeness of its staff. This is what’s so special about the Restaurant, adapting to the continuous changes and needs of the environment without changing the aspects that make it stand out through history. A history that is palpable in every corner of the Restaurant. The Guanches, in prehispanic times, chose this valley as a settling place for its natural caves that worked as a shelter and as a food storage place. Its flora, with almost 80 endemic species, and its steep geography, makes the ravine one of the symbols of the Gran Canaria Island. 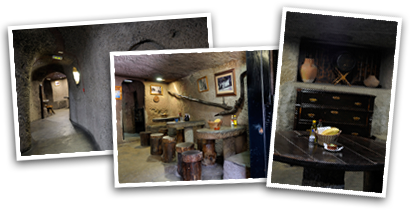 The origins of the RESTAURANT El Centro start in the eighties when, following the wisdom of the ancient inhabitants of the island, we gave shape to one of those original caves until it became a small bar. Warm in winter and fresh in summer, the cave becomes a meeting point for the locals and tourists that venture into the paths of the ravine. Its Menu, always connected to its gastronomic origins in the islands, based on potatoes, olives, cheese and wine as a accompaniment to the gatherings in the long summer days and the humid winter afternoons. It is in the last decade that the capacity of the Restaurant has seen itself increased at pickaxe strikes and always, with enthusiasm, commitment and hard work to achieve a goal that seemed unattainable: make every visitor enjoy a walk through history thanks to the rustic and elaborated natural caves, designed to assure intimacy and comfort to our clients; and at the same time allowed to house a large number of people. Nowadays, the Restaurant has a wide gastronomic offer of over 50 dishes with a common denominator, quality in our raw material. All these products are elaborated by hand and following the recipes of our predecessors to make our clients part of the gastronomic history of our island through their palate. With this website we would like to lay the foundations of many more years of service and invite you to come savour any of our grilled products, our awarded fried pork or simply our excellent Gofio, accompanied by our local wine. It is our particular tribute to our island of Gran Canaria. This page invites you on a virtual tour of our Restaurant through 360 degrees photographs to get to know the spaces that make our restaurant an original place.